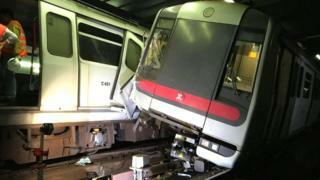 Two subway trains have collided during a new signal system test in Hong Kong, halting services and threatening travel disruption for millions of commuters. The incident occurred between the Central and Admiralty stations before the service was open to the public early on Monday morning. While the trains had no passengers on board, both drivers were taken to hospital. Rail officials warned that repairs were likely to take "quite a long time". Network operator Mass Transit Railway (MTR) said sections of the Tsuen Wan Line had been suspended and urged commuters to avoid the route affected and to use other forms of transport if possible. MTR Corporation has said a failure with the new signal system was to blame for the crash, Hong Kong's South China Morning Post newspaper reports. Further disruption was caused later on Monday morning when a woman fell on to the tracks at Kowloon Tong station, causing a temporary suspension of service in that area. Hong Kong's subway network is used by up to six million people on weekdays, Reuters news agency reports.